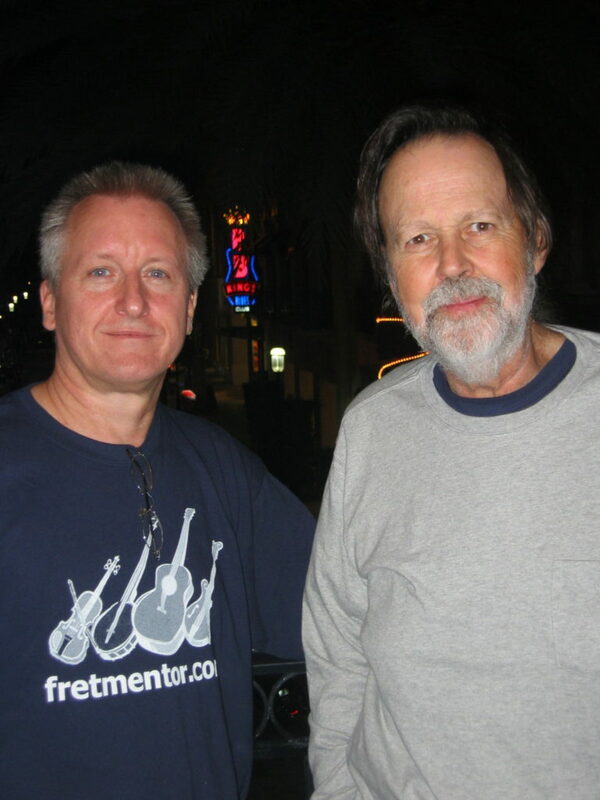 On the weekend of January 28th, 2012, I had the honor of hosting banjo legend Alan Munde at my Fretmentor workshop for banjo, guitar, mandolin and fiddle players. 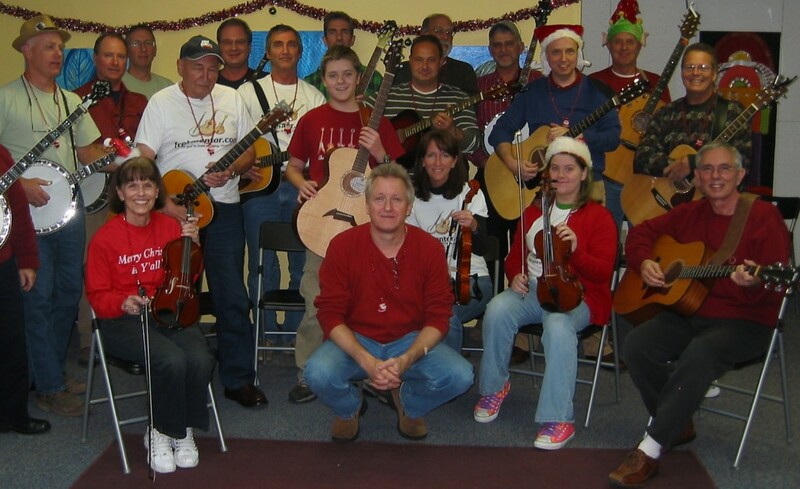 Additional instructors at this event included Byrone Berline, a fiddle legend, and Jim Hurst on guitar. What made this a special event is that I have studied Alan’s banjo style since the day I first started playing the banjo. That was back in 1970. I read about Alan, studied his various musical transcriptions, and listened to some of the best banjo albums (such as Alan Munde’s Banjo Sandwich) that I have ever heard. I never imagined at the time that I would be hosting Alan at my home in my lifetime. Now, as we adjust the clock forty two years later, I had the pleasure of sitting down and picking a couple of tunes with Alan Munde, as well as Elliot Rodgers, one of Alan’s music partners. In addition to the workshop, we had the opportunity to walk our beaches here in Jupiter, Florida and enjoy some of the restaurants in the area. He was a great guest and one of the most humble musicians I have met. Next, we sat down and I conducted an interview of Alan Munde about his life and the impact he has made on the history of bluegrass music. This idea came to me many years earlier, when I first saw a copy of the Fretboard Journal on the news stand. 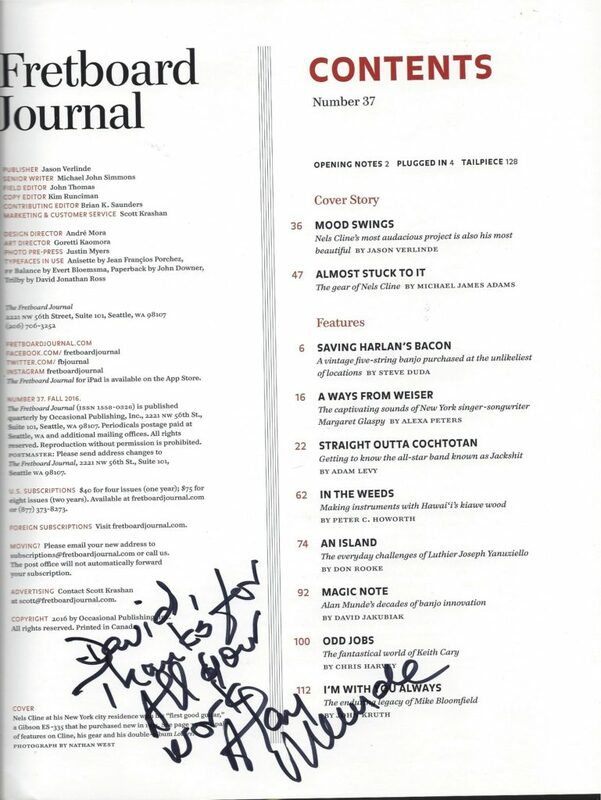 I contacted Jason Verlinde, the publisher of this high quality quarterly magazine. Jason was very receptive to publishing an article on Alan Munde. He recognized how significant Alan Munde is as a musical icon and as a banjo legend. It took awhile to get this article published but we finally saw the final product in print with Issue #37. 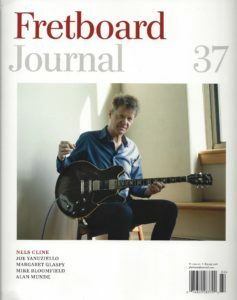 You can order a copy of this magazine by contacting the Fretboard Journal at their website. You may also still be able to find a copy of this magazine at your local Barnes and Noble or other book store in the area in which you live. I highly recommend that you read the article on Alan, as well as subscribe to or order other issues that are available. Finally, it was a thrill to get a personally signed copy today in the mail, from Alan himself which read “David, Thanks for all of your work – Alan Munde”. In return, I have to say to Alan, thanks for the great memories and thank you for all you have done for the music world. What is a drum dial and how can you use it to set up your banjo head correctly? 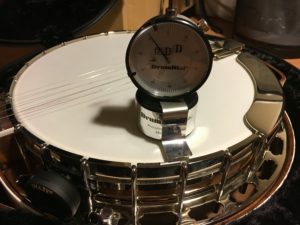 Fretmentor student, Justin Lambert, explains the process of tuning your banjo head with a Drum Dial, in today’s guest blog. Tuning the head on a banjo is quite simple with the use of a “drum dial”. I bought mine online, though you can check your local drum shop. Your banjo head should be tuned to G#, this will help your banjo ring and have good sustain in each note. First, tune your banjo as close as you can to open “G” tuning and move the bridge to set the intonation. You can chime the #1 string at the 12th fret to see how close your intonation is to true. If your banjo is in tune when “open, or unfretted”, yet sharp when fretting at the 12th fret, you need to move the bridge towards the tailpiece. 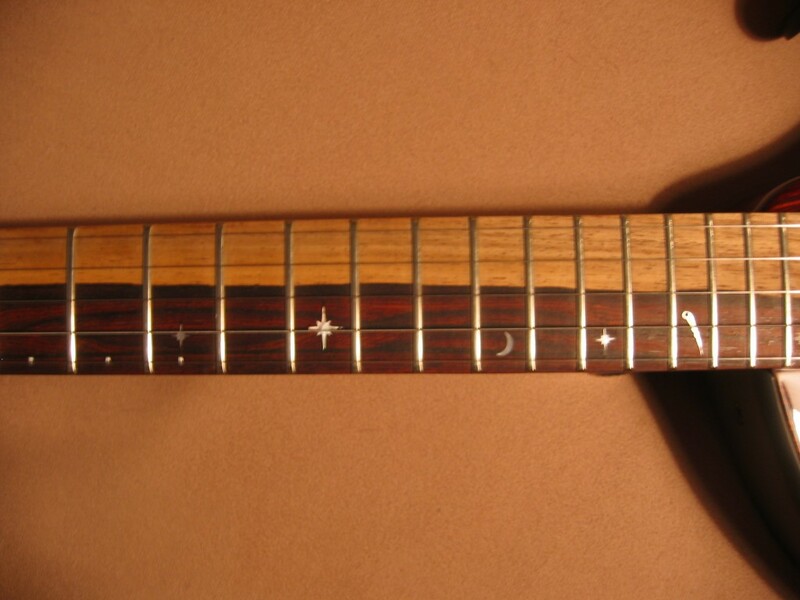 Move the bridge towards the neck if you are flat when fretting at the 12th fret. Once you have this accomplished, you can begin to tune your banjo head. 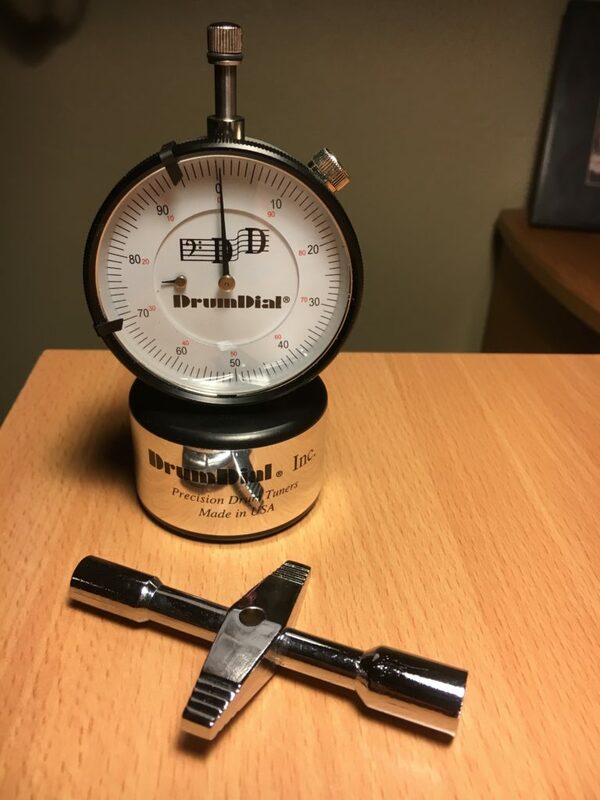 First, you need to calibrate your drum dial by placing it on a piece of glass and setting the needle to “0”. Second, remove the resonator from your banjo by loosening the 4 caps or screws holding the resonator to the flange. Place your banjo on a towel or stand lying flat and place the drum dial about 1 inch from the edge. As you move the drum dial around your banjo head next to each hook, you might notice the dial registers 89, or 92. The number is not important, you just want the number to be the same at each “hook” all the way around the head. Go ahead and tighten, or loosen each hook working on opposing hooks all the way around the banjo. Do not work around the head in order, you will never get the numbers to be the same and most likely will damage the head. Tighten hook 1, then 12, then 6, then 18, then 3, then 15, etc. until you have the same number all the way around. Inevitably some hooks will be loose from tightening others, just snug these and keep moving around until they are all snug and you have the same number on the drum dial all the way around your banjo. Third, you will have to retune your banjo and possibly adjust the bridge ever so slightly. You should definitely notice your banjo “ring”, especially when hitting the first string. If it isn’t ringing just yet, you can go back and slightly tighten each hook (paying attention to your drum dial numbers, and the hooks closest to the tailpiece). Fourth, replace the resonator and then play your banjo, you should notice a difference in both the sound quality and sustain. I recommend checking the head with the drum dial again within the next few days to weeks as some settling in will occur. Simply follow the above steps to get your banjo ringing and sounding great. About today’s author: Justin Lambert is a ceramic artist specializing in one of a kind wood fired functional pottery made and fired at his home studio in Jupiter Farms, Florida. He has wanted to learn banjo for many years, having played some piano as a child, and alto saxophone seriously as a teenager for many years. He is a current Fretmentor banjo student. 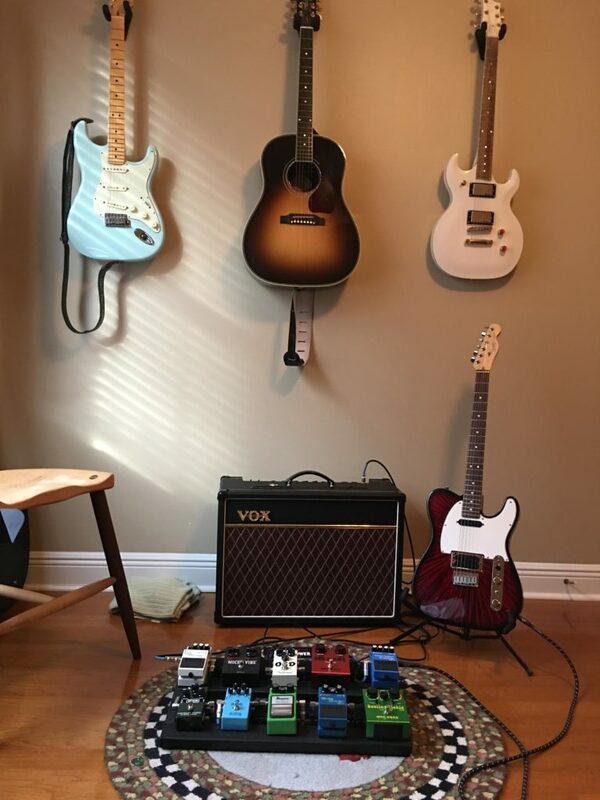 After years of playing the acoustic guitar, I finally branched out a few years ago and bought my first electric guitar. My “starter” amp came with some built-in effects – distortion, overdrive, reverb, chorus and delay. Before long, I was interested in finding different sounds or trying to duplicate sounds from guitars in my favorite songs. And so… I began experimenting with effects pedals. A couple of years into it, I am still just scratching the surface. But I have learned a few things that might be helpful to anyone who may be thinking of, or doing, the same thing. Here are a couple of basic lessons I have learned that are worth passing along. First, effects pedals are like fishing lures – most of them are flashy and are designed to catch more fisherman than fish. Don’t run out and buy the shiny pedal with the maximum number of flashing lights, knobs and sophisticated features. If you are just branching out into effects pedals, these pedals are way more than you need. You will spend more time messing, tweaking, tuning and fidgeting with knobs and buttons than playing, and you still won’t understand how the darn things work! If you do some research, some of the highest rated pedals are also the most simple. 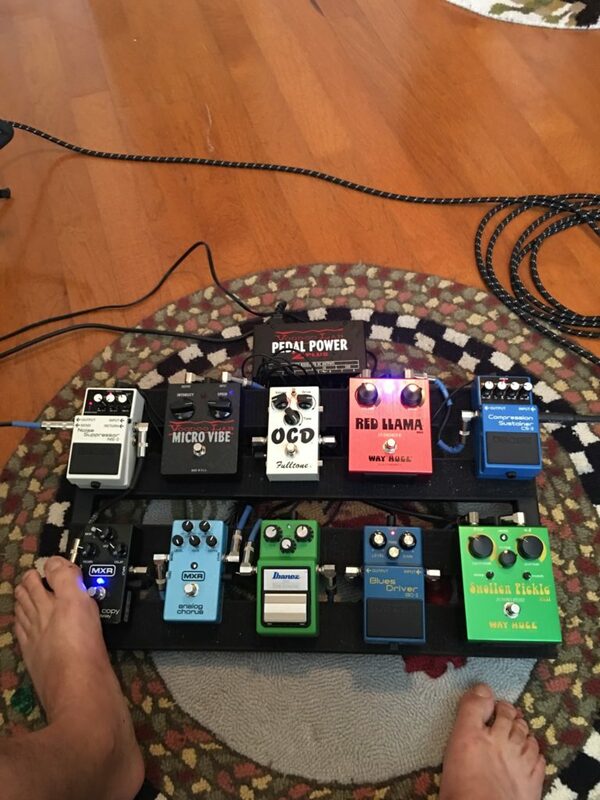 Many of these pedals have been around for 30 years for a reason. They are easy to use, they work and they give you a great sound. Save your money and start out with fairly straightforward, simple pedals. Second, while most pedals will take a 9-volt batter to power them, it’s best to connect them to a reliable power source. Battery power is probably best if you are transporting your pedal board a lot (most boards come with their own brief case to transport them). But if you are like me, you will forget to turn them all off when you get up to answer the phone or something. There’s nothing more annoying than sitting down to play, warming up your amp, tuning your guitar and then… changing 3 or 4 batteries. Most pedal battery cases are not snap-off – it involves a screwdriver. Also, the pedals are usually attached to the pedal board by adhesive velcro on the bottom. So, frequent battery changes are out of the question. A power source is the way to go. There are a couple of different power sources. The One-Spot is a simple power source that plugs directly into the wall and has a chain of up to eight connectors for pedals. They are fairly cheap. However, the One-Spot is really only useful if you are using one or two (three tops) pedals at once. The more pedals you have on, the more the system has a problem evenly distributing the power and the effects will fade in and out. If you are going to use more than one or two pedals, it’s best to spend the money on a real power source, like the Voodoo Labs. These are converters that will run 8 or 10 pedals and deliver steady power to multiple pedals at once. Andrew Baumann, a fretmentor student and attorney by trade, contributed this article. Sierra Hull’s Trio at the Lyric Theatre. Sierra Hull introduced her newest music project “Weighted Mind” February 11, 2016, at the newly renovated Lyric Theater in Downtown Stuart. 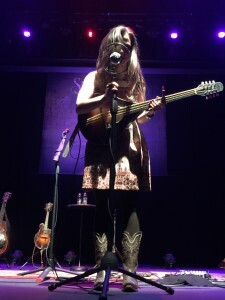 She was joined onstage by Ethan Jodziewicz (double bass) and Justin Moses (banjo, dobro and mandolin). Ms. Hull easily lived up to her widespread acclaim as a mandolin virtuoso while her voice was both expressive and soothing. Although it had been five years since her last musical release it was obvious she has been working very diligently continuing to master her craft and expand into the landscape of songwriter and lyricist. 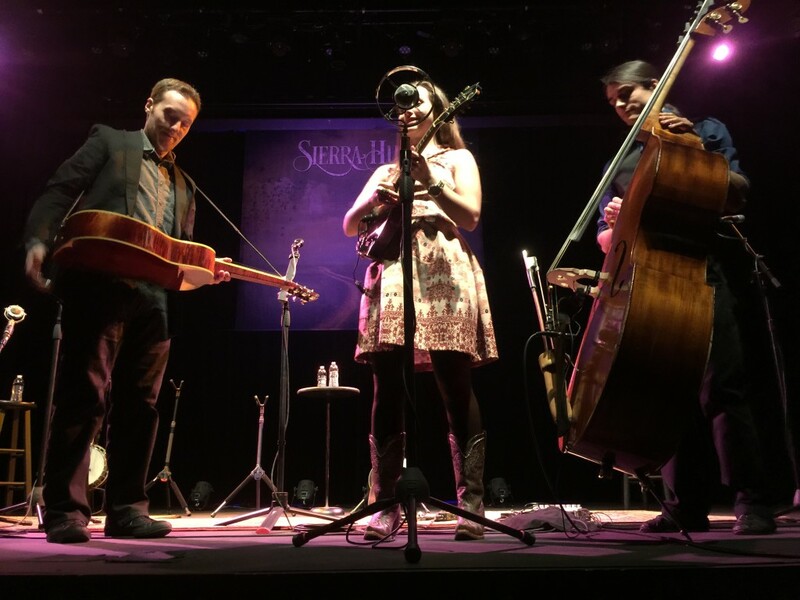 While the roots of bluegrass could be found interspersed throughout her presentation it seems her music has moved into another realm where it intersects with a variety of styles. The trio performed most, if not all, of the offerings on Weighted Mind. She told the audience the album had been a couple years in the making and lyrics for several songs referenced the growth pangs associated with travel from teen years to full adulthood, not to mention living up to lofty expectations coming from her early success. It seemed as though the age of twenty-two must have been especially rough for the now twenty-four year old. Both “Stranded” and “The In-Between” describe the turmoil of being twenty-two. Other lyrics also revealed doubts and insecurity (“Compass” and “Lullaby”). Perhaps the most revealing song was her first encore offering which she shared with the audience as being written on a particularly vulnerable evening even though the words were positive and future-looking. Musically the trio was inspiring and complex. Ms. Hull lived up to her reputation and training on both the mandolin and mandola. Mr. Jodziewicz excelled on the double bass, bowing the strings as much as plucking. Mr. Moses’ banjo style was reminiscent of Allison Brown and he played mandolin toe to toe with Ms. Hull. His dobro work was just as enjoyable. All in all, a wonderful show in a wonderful setting, especially if you were lucky enough to be front and center! Talk about going to see a concert in style. On the weekend of May 16-17, 2015, a very special woman in my life and I took a romantic two night cruise to the Bahamas to celebrate my birthday. An enticing aspect of the cruise was to see Scottish born singer/songwriter KT Tunstall. KT has recorded five studio albums and has received multiple Brit Award nominations, including winning the Best Female Solo Artist and a 2007 Grammy nomination for Best Song “Black Horse and a Cherry Tree”. This is a great song to not only dance to but also to perform yourself. Her hit “Suddenly I See” was featured in the motion picture The Devil Wears Prada, which lead to her interest in composing for films, including “The Kid”, “A Winter’s Tale” and the latest “We Could Be Kings” for Disney’s motion picture “Million Dollar Arm”.. For those of you who do not know of KT Tunstall, I highly recommend you check her music out. So a little about the cruise. The two night cruise originated from the Port of Palm Beach, in West Palm Beach, Florida. A friend and I got an early start on Saturday May 16th, wandering the ship, and enjoying the food and drinks. While having dinner in the dining area, the cruise took off at about 6:30pm. After dinner, we went to the clubs, a martini bar and the casino. I danced the night away with my incredible dance partner to both a country rock band, as well as in the disco lounge. Sunday morning was spent away from the ship in the Bahamas Yucatan Grand resort. We walked the white sandy beaches, laid out at the lap pool overlooking the ocean and toured the Freeport Market Place after lunch. 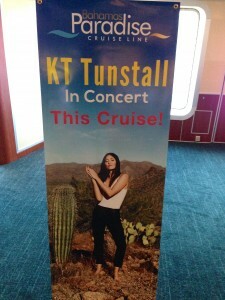 Upon arriving back at the ship, dinner was followed by the KT Tunstall concert. Afterward, we danced well into the night, until we arrived back home at 8 am. Once back from the Bahamas, I made sure we upgraded the general admission tickets to get the best seats possible at the Grand Theatre section of the ship. We waited in line and sat in the 2nd row. KT Tunstall promptly started at 10 pm. 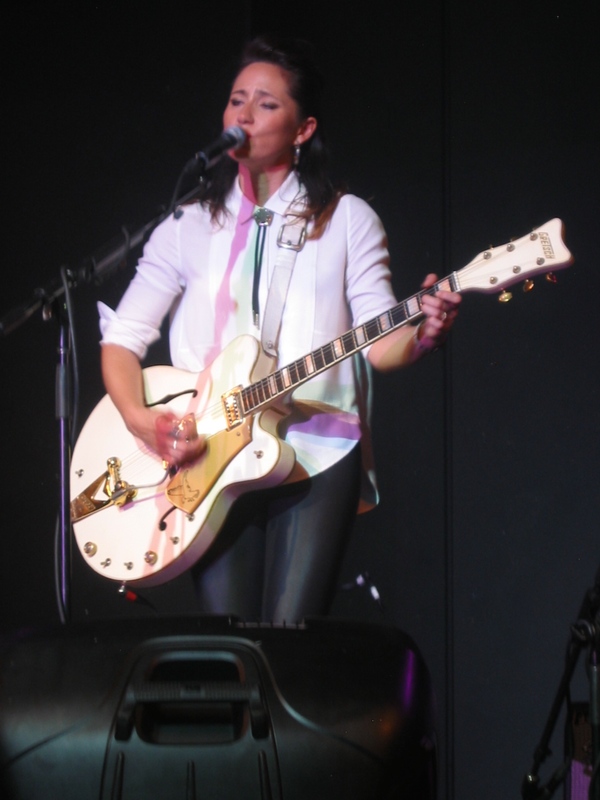 For those who are not aware of KT Tunstall, she is a master at using effects pedals and especially loops to supplement her rhythmic guitar strums and singing. The effect is like a drum machine, except she provides background vocals, hand clapping, guitar tapping and even a kazoo to get special effects. Not only can she sing but her timing, dynamics and rhythmic guitar strums sets her apart from many performers. She jokingly introduced her band (the effect pedals) as coming from Taiwan. Ever since playing a couple of Tunstall’s tunes, I always planned on seeing her in concert. In addition to my two favorites (“Black Horse & A Cherry Tree” and “Hold On”), KT performed a number of her songs from her albums “Drastic Fantastic” and “Eye To The Telescope”. Songs such as “White Bird”, “Other Side of The World”, and “Under The Weather” all were well received. Yet, KT played a number of cover tunes such as “Don Henley’s “Boys of Summer”, Fleetwood Mac’s “Landslide”, “Walk Like An Egyptian” and ending with an audience favorite Jackson Five “I Want You Back”, with her own signature style rhythmic variation . 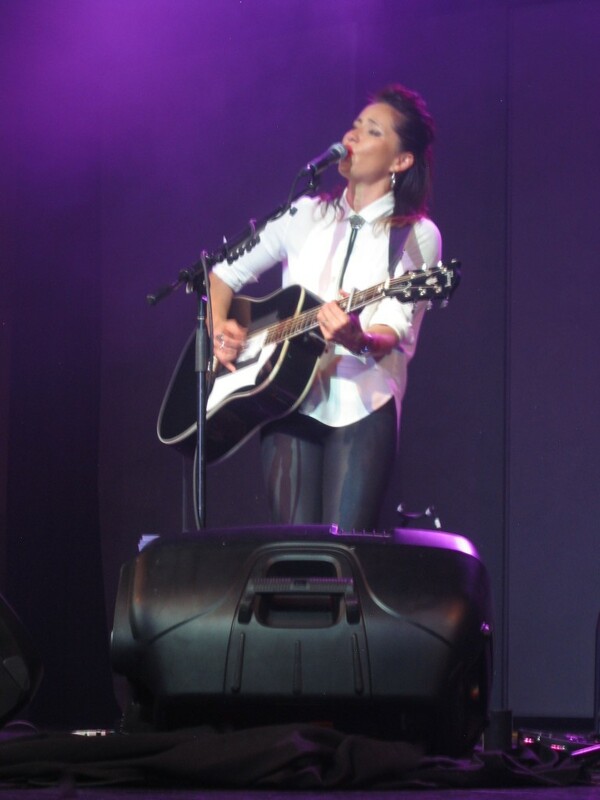 KT Tunstall’s show lasted an impressive two hours. Throughout the show, KT Tunstall engaged the audience and telling stories such as the time she was recognized by one of her favorite female vocalists; Fleetwood Mac’s own Stevie Nicks. She even invited many of the women (and the men who all chose to stay in their seats) to join her on stage to dance during one of her songs. The show was an intimate and personal experience. Both the concert and the cruise made this one of my favorite birthday experiences of all time. PLEASE NOTE: I will be posting concert photos (WITH A LINK HERE) and maybe some more cruise photos on my website at www.fretmentor.com. and on my Fretmentor Facebook page. So please check back for updates. I remember it as though it was yesterday. On April 2, 1992, an old friend and I attended the BB King concert at the now defunct Carefree Theatre, located in West Palm Beach, Florida. It was a great concert and I believe his album “Live At The Apollo” was recently released. After the show, I waited until the audience cleared out and went to the stage. I asked the set up man if there was a way BB King could sign my program. 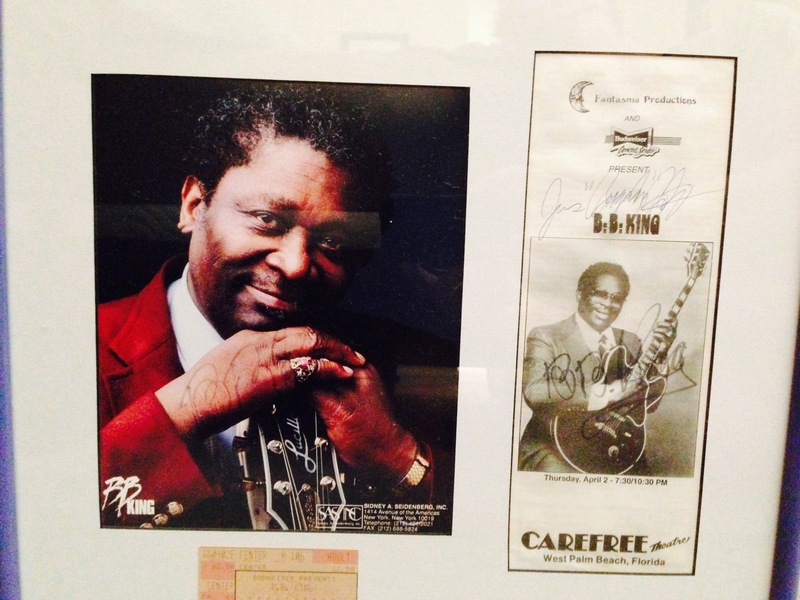 I never collected autographs until then, but I was impressed enough with BB King that I wanted to take back a memento. The man suggested that I go to the side of the building where his bus was parked to see if he was available to sign. We walked to the bus and I ran into his cousin (the trumpet player) who signed the program. I was thinking to myself, this just wouldn’t cut it with my friends if I didn’t get BB to sign the program himself. I asked if BB King could sign it and his cousin said while BB is eating between sets, maybe I should try to come back after the 2nd show. So, we went home, changed clothes, and returned an hour later. We patiently waited outside, even though it started to slightly rain. You could hear the last show coming to an end. When it did, BB King appeared and was escorted into his bus. He sat at the passenger seat, got a back massage and drank some orange juice. Approximately 30 people were waiting to greet him. I was one of the lucky ones that night as well. At 1:30 am in the morning, BB King took the time to greet each and every fan. When it was my turn to meet him, I shook his hand, chatted with him briefly about his music and told him I am studying his instructional videos. I even suggested he write a companion instructional book and he said that is a good idea. I doubt I had any thing to do with it but a book came out later to match his instructional VHS tapes. From that day, I felt blessed to meet a man as humble as BB King. Although he was a star at the time, he never forgot his roots, which explains his desire to please the fans that sat in the rain to see him that night. I went and saw him another eight times. 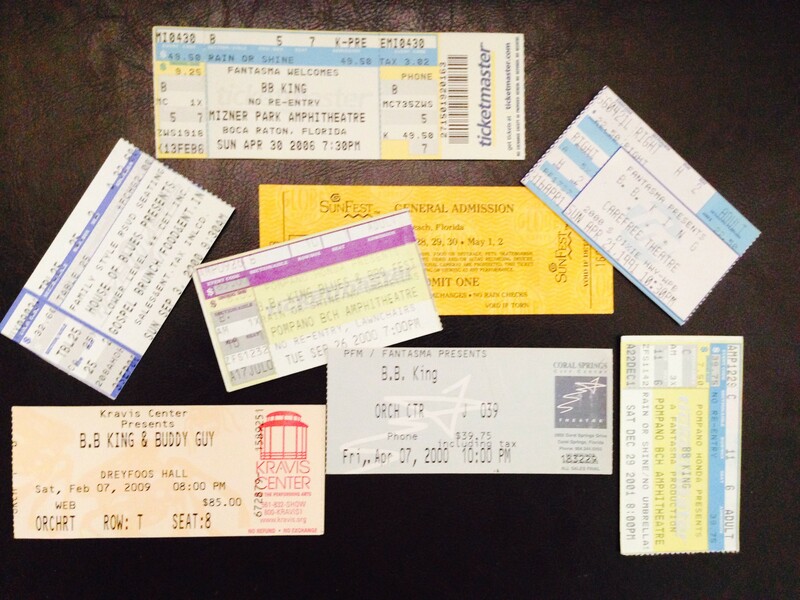 All the concerts provided lasting memories. Yet, none of them will surpass the night I was able to personally meet the King of the Blues. On May 14, 2015, the music world lost a legend. In my heart, the memories of BB King will always live on. I regularly teach community education music classes through the Palm Beach County School system. The classes at Palm Beach Gardens High School are primarily for beginning students, many who have had a limited or no background in music. At the first class, I usually ask my class to raise their hands if they are serious music students. Each student always enthusiastically raises their hand. I then, ask the question again but this time emphasizing the word “Serious”. I explain to the class that to be successful at playing music, one must have patience and be dedicated to practicing each and every day. A student should practice an hour a day to develop finger strength and follow their instructors advice regarding the instructional materials. Community education classes offer a unique opportunity for a student to learn an instrument at an unquestionable cost savings. A typical half hour lesson in this area of the country is $32-36. The community education class, which last for seven to eight weeks at an hour per session costs a total of $28-$36 (not including materials). I sometimes joke that the school should charge $500 and refund all but the $28-36, based on perfect attendance. That would create a financial incentive to attend each and every class. 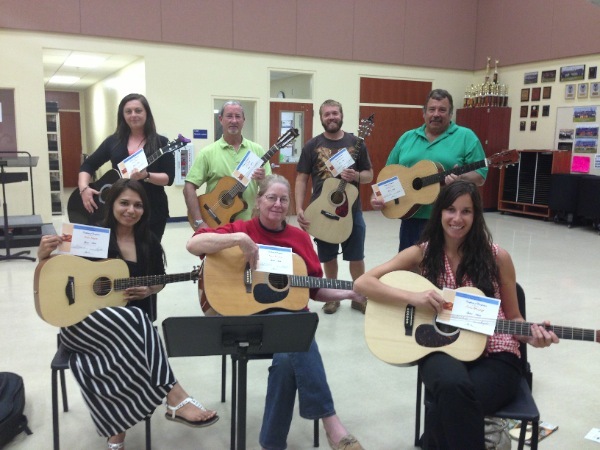 Above is a picture of the latest class of students who started a six week beginning guitar class. Keep in mind that they insisted they were going to be serious guitar students. Yet, if you refer to the picture below, you will see our final smaller group of students who were dedicated enough to at least complete the course. Hopefully they will continue in their pursuit of becoming competent musicians. I truly believe that at first, students have very good intentions when starting to learn an instrument. In their own mind, they are very serious about learning. Yet, playing a musical instrument is not simple. If it was simple, than becoming a musician wouldn’t be special. As I mentioned above, learning about music requires patience and dedication. For adults, it means accepting the fact that you are once again in grade school and have to place your ego aside and accept your early limitations. However, hard work will pay great dividends. Just read the comments below from those who have made it happen. I extend my congratulations to these seven students who completed the class. For every class I teach, a handful will step up and become good musicians over time. Hopefully, their enthusiasm will stay with them throughout the many years ahead. I wish them luck. That time of year is right around the corner. The Christmas holidays are fast approaching and while you may be asking why I am writing about it so early, it is not too soon for music students to start brushing up on those holiday tunes. Just this past week, I spent time in the studio recording my original arrangement for “We Three Kings”. 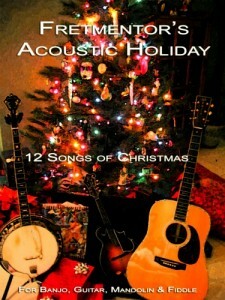 I arrange and recorded all three parts for guitar, mandolin and banjo. It will be released at www.frementor.com in a week or two. Best of all, it will be part of an album entitled “Jingle Jam 3” produced at the music studio in which I teach. 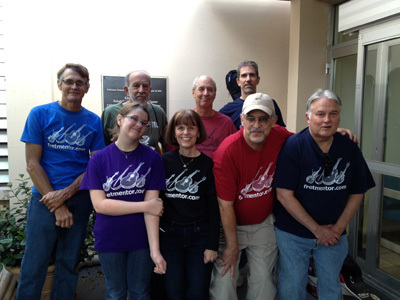 Most of the studio’s music teachers participate in this project on an annual basis. Last night at my beginning guitar class, I asked everyone if they could name a song that everyone else in class would know. It took them awhile before they all agreed on one particular song that we could address and learn to play. I explained to them some of the best tunes to learn to play are Christmas tunes. Even those who do not celebrate Christmas would easily recognize a song like Jingle Bells or Silent Night. Next, I explained that if the melody line is already on your mind, learning the piece will be less cumbersome. This is one reason why holiday songs are good songs to learn, especially for the beginner. There are other reasons to learn Christmas tunes. If you play standard country, rock and roll or blues, you will soon realize that some of the songs are quite basic and may in fact, only involve three or four different chords and some are in the same Key. While this may also be true for some basic Christmas tunes, there are many (such as Chestnuts Roasting On An Open Fire or O Holy Night and more) that have quite sophisticated chord structure. Learning to play such arrangements makes you a better student when it comes to mastering chord structure on your instrument. Fretmentor has arranged a 12 song holiday collection for guitar, banjo, mandolin and fiddle. What is nice about this collection is that each tune has tablature and standard musical notation for each of these instruments. That is perfect if you want to play songs together in a small group or band. Some come along with recordings and rhythm tracks. Lyrics are also included. You can purchase the collection through the fretmentor website (www.frementor.com) or by contacting us via email; david (insert @ symbol) fretmentor.com. So it is definitely not too early to brush up on learning holiday songs. Don’t be surprised if at the next holiday party, someone asks you whether or not you know some Christmas tunes. Start practicing today and you may have some ready for the upcoming holiday party. Over the past number of months, I have been busy working on a new blues instructional program for fretted instruments. One of the songs incorporated in my lesson plan is “Matchbox Blues”, which was written and recorded by Blind Lemon Jefferson in 1927. Many of you may not know who Blind Lemon Jefferson was but everybody from Carl Perkins, The Beatles, Eric Clapton, Stevie Ray Vaughn, Johnny Cash and more have recorded a similar version of his song (although in some cases titled “Matchbox”). 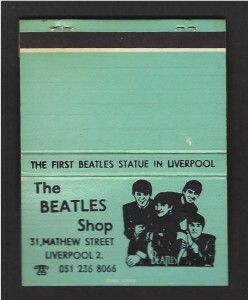 I am fascinated with the history of music and how it was promoted and advertised, long before today’s media extravaganza. 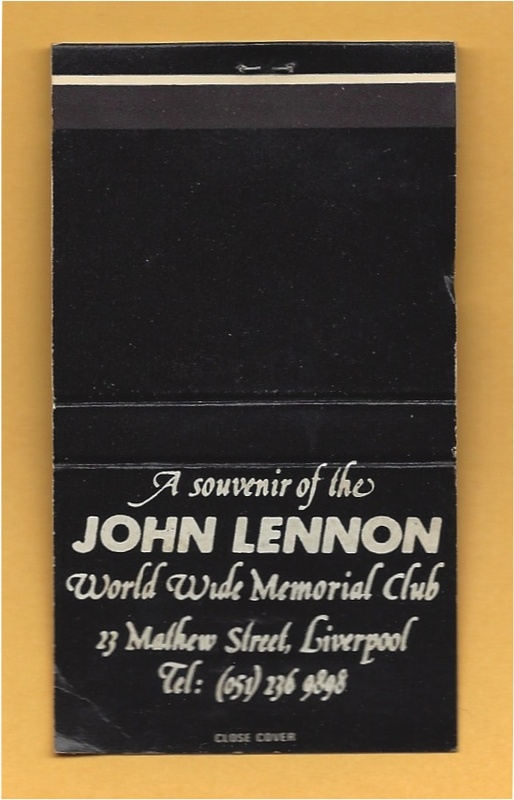 Which leads me to the point of this Blog and another one of my interests and hobbies; Matchcover Collecting. 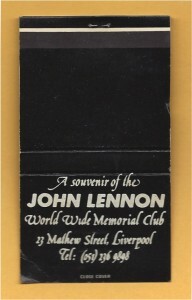 Most people have picked up a pack of matches at a restaurant or tavern which they have visited. I did so myself throughout the years and threw them in a bag. Years later I learned just how interesting older covers can be when I acquired a collection from a friend who’s father (a matchcover collector) died. It was then, that I became a true matchcover collector. A matchcover collector is known as a “phillumenist”. Each collector has preferred categories such as World War II navy ships, pin up girls (referred to as girlies), railroads, cars and transportation, disney, soda or beers, featured covers with printing on the matches, hotels, to name just a few. The time frame of “old” does not mean the 1960s or 1970s but as early as the 1930s and if you are lucky, covers dating even earlier than 1930. Do You Wish To Participate? 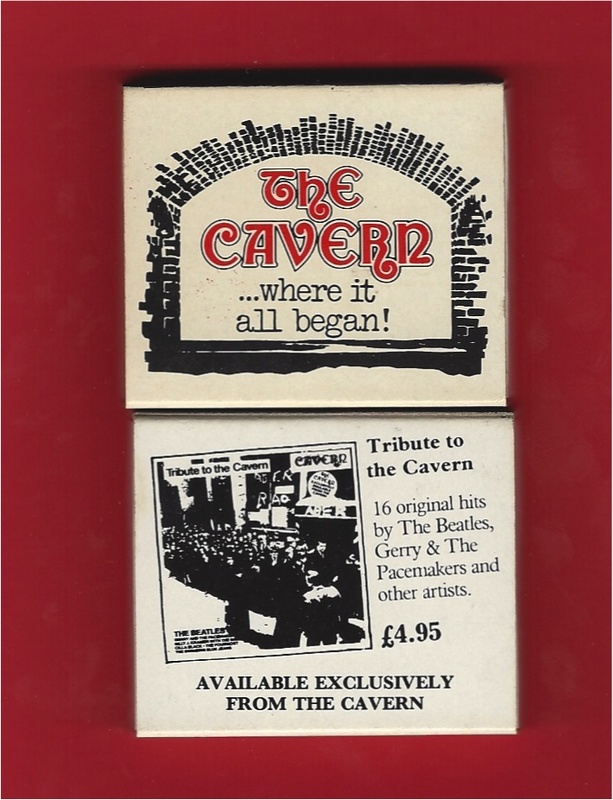 I am looking forward to adding more music related covers from not only my personal collection but from other collectors and non-collectors as well. I not only encourage, but invite you to send me any scans of music-related matchcovers to david (insert @ symbol) fretmentor.com. I will add your cover or covers to this digital collection. You can also share your story of the cover in the comment section below. 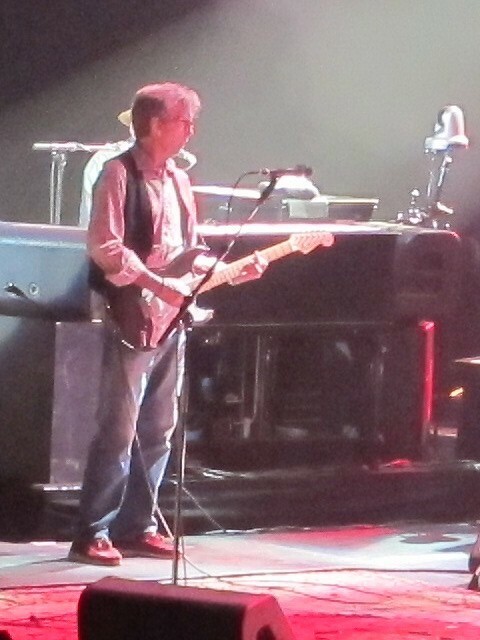 Eric Clapton performing in Hollywood, Florida, March 30, 2013. 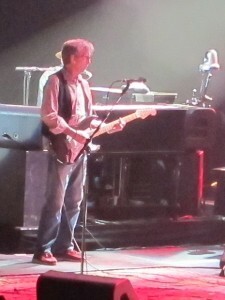 Slowhand celebrated his 68th birthday on Saturday March, 30, 2013, before a sold-out crowd at the Seminole Hard Rock Live. 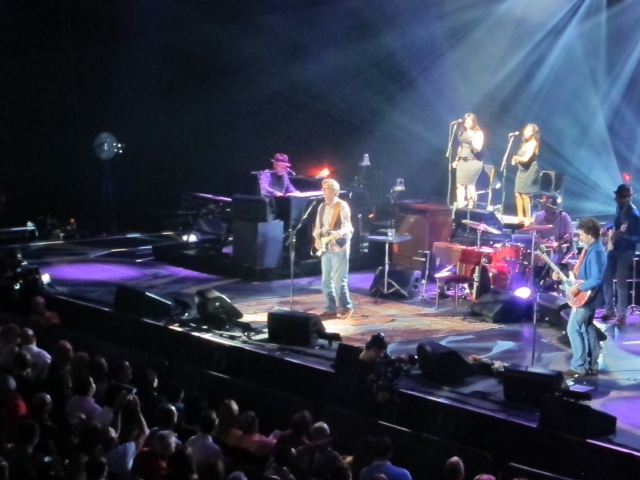 This was the second of two shows at the Hard Rock, and the venue was great, featuring really good acoustics and more than two hours of Eric Clapton doing what he does best. Honestly, he hasn’t lost a step. The show featured classic Cream and Derek and the Dominos tunes, some of Clapton’s own staples, some really great covers (including an outstanding cover of the Squeeze’s “Tempted” and finished with a heavy dose of awe-inspiring blues guitar. “Sunshine of My Love” anchored the Encore and the show concluded with the Joe Cocker tune “High Time We Went.” I would have liked to hear “After Midnight”, but we can’t have everything! Hello Old Friend, My Father’s Eyes, Tell the Truth (Derek and the Dominos song), Gotta Get Over Black Cat Bone (Albert Collins cover), Got to Get Better in a Little While (Derek and the Dominos song), Tempted (Squeeze cover), Badge (Cream song), Driftin’ (Johnny Moore’s Three Blazers cover), Lay Down Sally, Tears in Heaven Layla (Derek and the Dominos song), Wonderful Tonight, How Long (Ace cover), Stones in My Passway (Robert Johnson cover), Love in Vain (Robert Johnson cover), Little Queen of Spades (Robert Johnson cover), and Cocaine (J. J. Cale cover). 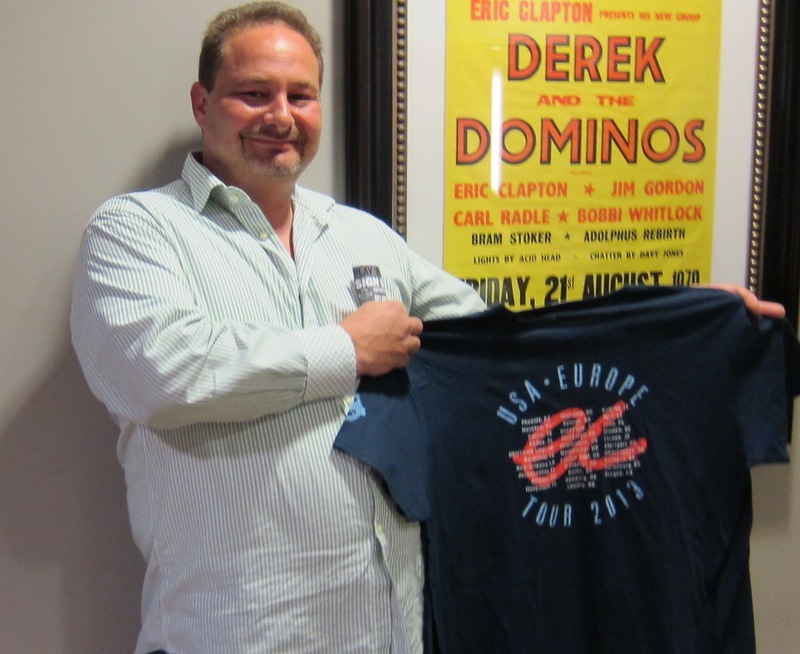 Andy with his official Eric Clapton 2013 Tour T-shirt. Clapton has stated publicly that he will stop touring at age 70 – so with only two years to go, this was probably my last chance to catch him (it’s been almost 15 years since the last time I saw him live. However, I’m hoping for some kind of “Out of Retirement” Tour or something along those lines. With any luck, after 50 years, there’s may still a little more road left for him Happy birthday Slowhand – you haven’t lost a step! Andy Baumann is a local attorney in West Palm Beach and avid music lover. Andy started learning the acoustic guitar about 4 years ago and has since branched out into electric guitar as well. U2, Guns and Roses, Eric Clapton, the Eagles and the Rolling Stones are his favorite groups. 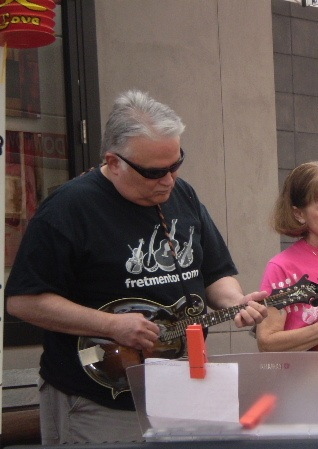 On November, 2009, I bought a Mandolin while in Galax, VA. I did not have a clue how to play it, but was determined to try (or use it as wall candy, if I was unsuccessful). I discovered Fretmentor a month later, and have been taking lessons and attending Blues and Bluegrass classes ever since. The first time ever, that I played before an audience was with a group at the Ed Healy Rehab and Nursing facility in West Palm Beach. It was extremely moving to see the audience’s appreciation. Practically everybody was in a wheelchair, but they were all smiling or singing or moving to the music. The residents were so uplifting that I still am not sure who got the most out of it; them or us. 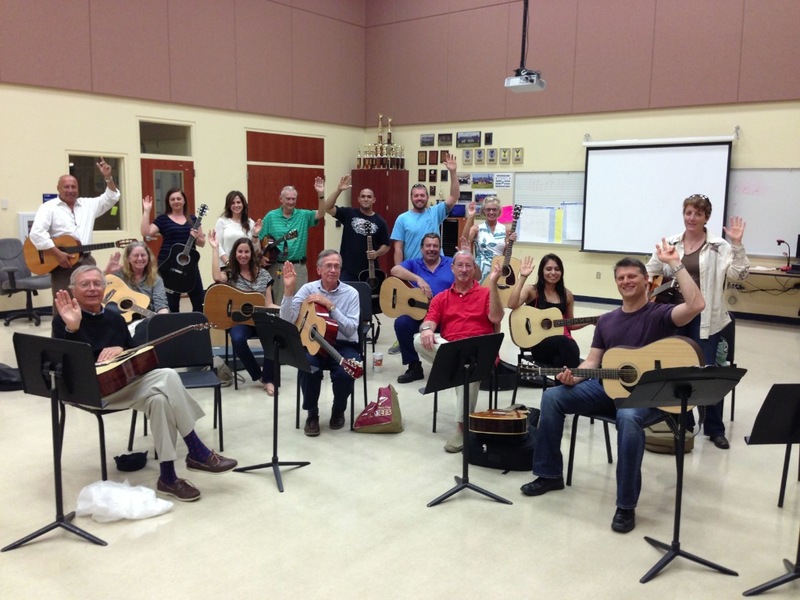 So, I was all in, when Fretmentor invited members of our Wednesday night class to join him at the Concert-A-Thon benefit in Palm Beach Gardens, on February 23, 2013. The event was intended to raise money for music scholarships for kids. There were two stages and multiple music groups playing throughout the day. At first, I was a little nervous. This was a bigger, more public venue, and I remember hoping that enough members from our class would show up, to drown out my mistakes. However, once we started, I was not nervous at all. Part of the reason was that I was so focused on the members of our group (all of whom were familiar faces from class), that I really didn’t have time to notice the crowd. I was pleasantly surprised to hear a smattering of applause after each of our songs. It was a lot of fun. Not only was it great practice, but it was special seeing other people enjoy what we do. I would recommend this experience to anyone. A new feature for Fretmentor’s Blog is to hear about the experience of other music lovers, students and performers . Today, I have invited a guest (Chick Veenstra) to contribute a story about his attendance at his first music festival. At Fretmentor’s Blog, I look forward to other contributions and musical articles of interest. Please contact me to see how you can contribute such articles. Take 50 acres of cut cow pasture complete with patties. 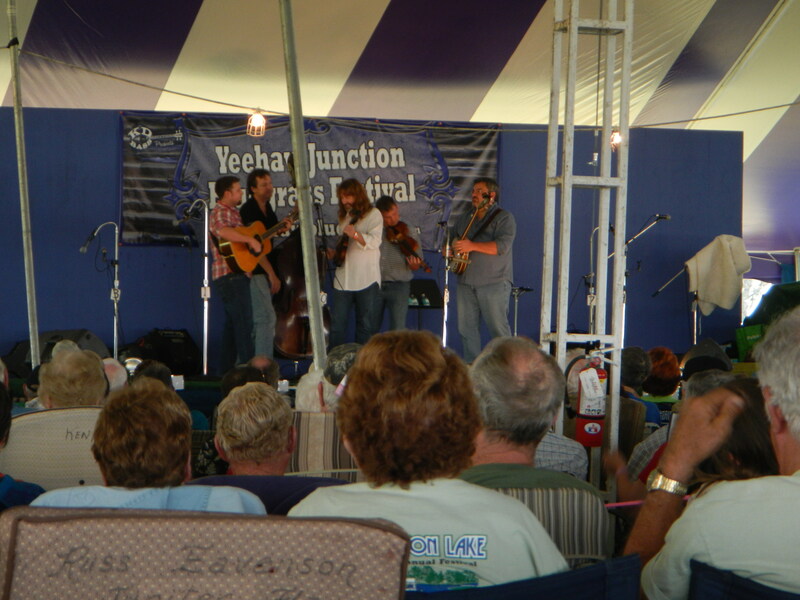 …and you have Yee Haw Junction—Good music, good people, and a lot of fun. As a first time attendee I was a bit apprehensive about the jam part, but a Bret, a fellow musician and friend, was also present and took me under his wing. I found the jams were friendly, and encouraging. The first night I struggled with hearing the chord changes, but by the end of the night things were getting easier. The second night was similar to the first one, but progress was made. By the third night, on slower songs, I found my self hearing and anticipating the chord changes and was able to play a reasonable back up. 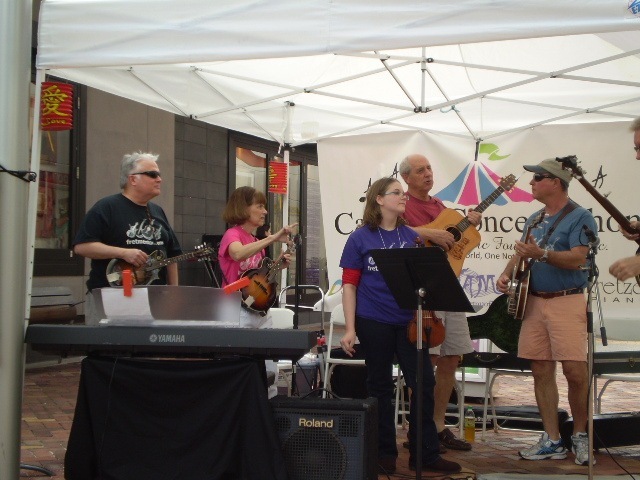 On Sunday morning there was a Bluegrass Gospel Sing and Jam. There were some twenty pickers and about the same number of people in the audience. A booklet with words and chords for the songs was handed out for the musicians to use. It took me a while to get used to changing chords on words and not having measures to know how long a given chord would be played. I was surprised that I was not nervous in front of the crowd since I was concentrating on the music (Now if I could only do that in class!). All of the bands were good, each one with a unique style and sound. 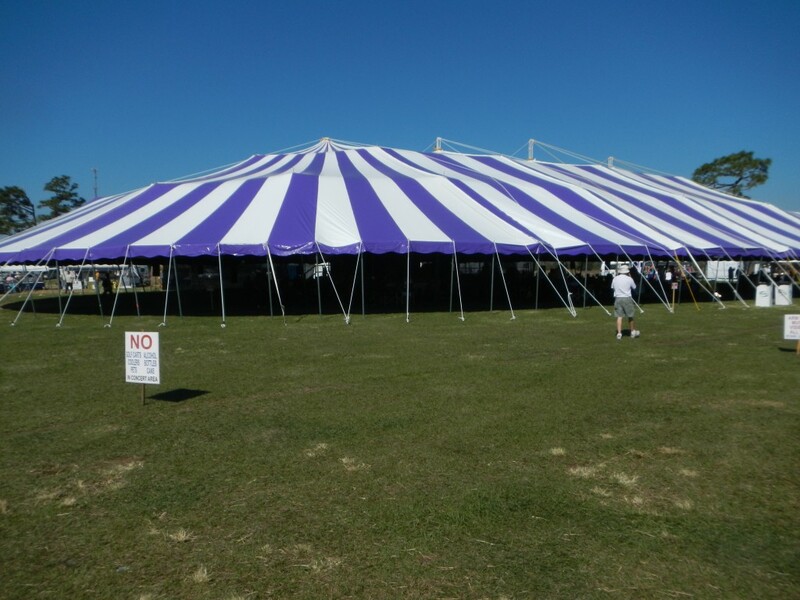 There was a variety of music; bluegrass, country, Gospel, original works, and one band even threw in some classical. 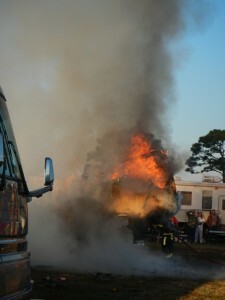 The only down side was when a RV, three down from me, burned up on Saturday morning. No one was hurt, but the weekend was ruined for some. I would recommend that everyone attend a festival. You will have a wonderful time and will have a better appreciation for what Fretmentor has offers when trying to teach us about playing with others. Note: Chick Veenstra is a retiree from the lumber and building material business and lives in Wellington, Florida. He started learning the banjo about two years ago. Says Chick “I have always liked bluegrass and the sound of the banjo so I decided to give the banjo a try. 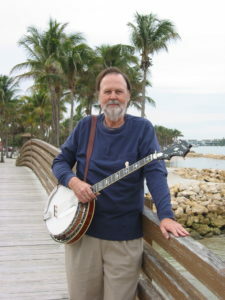 I am taking lessons from Fretmentor and attending his Wednesday night Bluegrass class in Jupiter, Florida”. 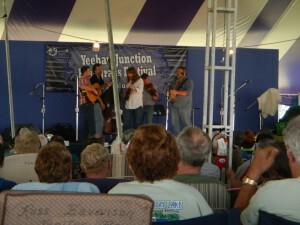 Yee Haw Junction was Chick’s first Bluegrass Festival. Have you ever been to Nechville? I bet you didn’t know it’s located in Minnesota. Nechville, however, is not a Town but a wonderful toy store for the banjo enthusiast like me. Since 1989, Nechville has been manufacturing professional banjos for both the acoustic and electric banjo markets. There are a number of well known musicians who own and play a Nechville banjo, including two of my favorites; Bela Fleck and Alison Brown. I recently purchased a custom made banjo from my friends Tom Nechville and his sales associate Al Price. 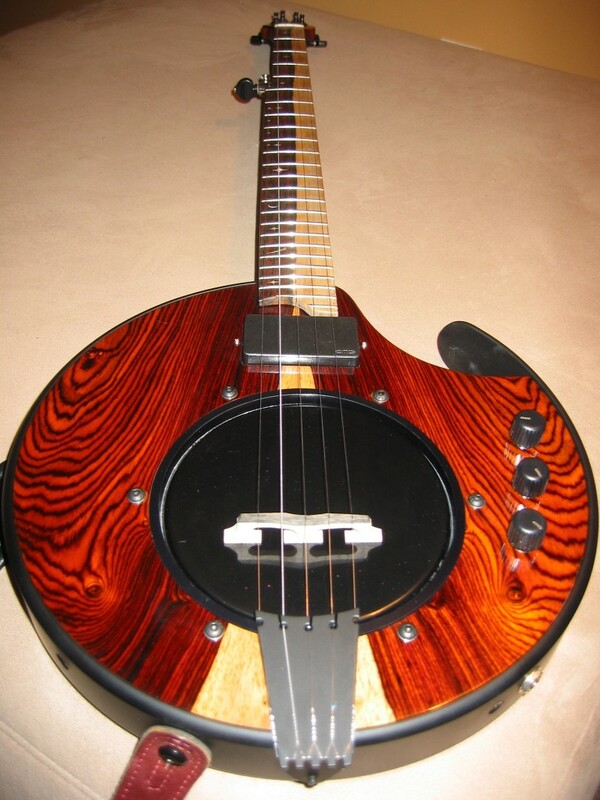 The banjo I ordered was a custom made Nechville Meteor electric banjo. 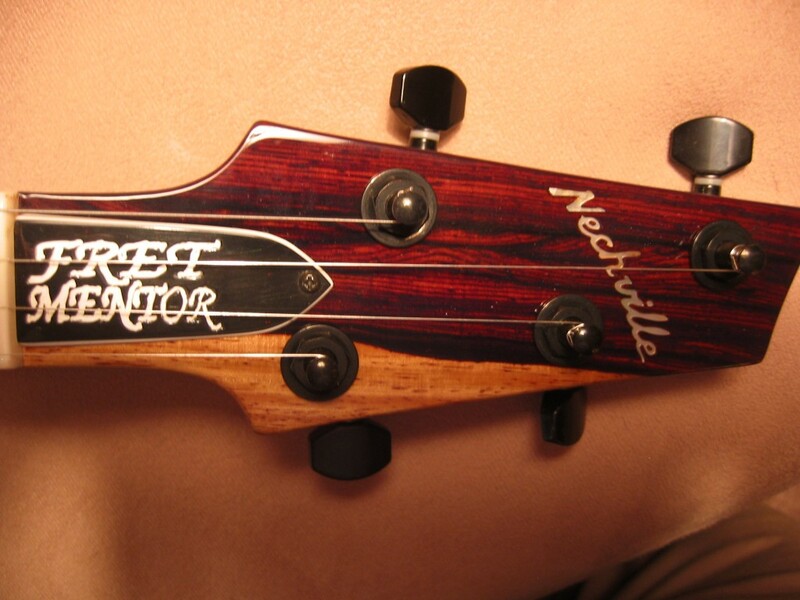 The custom options I selected for my banjo included a neck and body made out of a distinctive and exotic Cocobolo wood. The wood grain (as pictured in the neck and body) is from one piece of wood. Since I wanted a banjo that was unique and not some off the shelf model, I invested in a custom inlay pattern known as the Starizon pattern. The inlay on this banjo was a nice compliment to the premium wood selected for the neck. As for the dual pickup system, I added the active EMG81 magnetic pickup to the standard Piezo pickup system. While Nechville offers a unique option known as a tunneled 5th string, I guess I am a purist and am so use to the 5th string peg on the banjo that I elected not to add this option to the instrument. The banjo took 90 days to produce and it was well worth the wait. Tom Nechville, Al Price and the Nechville craftsmen (Dave Hill and Jeremiah Lindstrom) did a wonderful job in communicating about the production and shipment of this banjo. The Nechville Meteor Electric banjo makes a nice addition to my collection of banjos. A new feature for Fretmentor’s Blog is to hear about the experience of other music lovers, students and performers . Today, I have invited a guest (Silvia White) to contribute a story on her recent experiences playing music for a special group of elderly residents who welcomed and appreciated their gift of music. 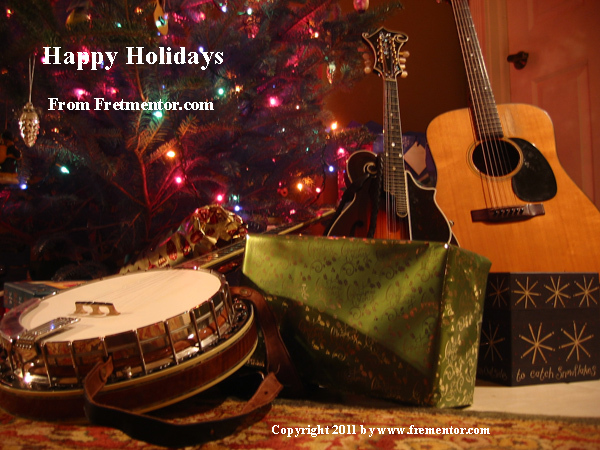 At Fretmentor’s Blog, I look forward to other contributions and musical articles of interest. Please contact me to see how you can contribute such articles. When I retired from teaching I started taking guitar lessons from FRETMENTOR. My mom was delighted at my new “venture” in life as I had quit playing the piano long ago against her wishes and my dad’s. She kept asking me when was I going to play at her assisted living facility. My reply was always: “never….I’ll never be “that good”. Each Christmas I would ask her what she wanted us to give her and she would always reply that she just wanted my husband and I to play music for them….she was relentless…so I finally gave/caved in. Our first “performance” was three years ago. I made up booklets of songs that my mom had requested us to play with all the lyrics and each person got a book so they could sing along and make it more festive. Boy, was it a hit….my nerves stopped as soon as we played the first song and all the residents started singing as loud as they could. My “non-expertise” was not noticed. Music just brought all the residents alive! There was this one gentleman in a wheel chair that hadn’t stood up for a long time and when we got to the patriotic songs and played and sang Anchors Aweigh, the Navy tune, he stood up and saluted us, (his wife told us he had been in the Navy during the Korean War)….I still get tears when I think of him. Now each time we go to visit my mom and they see us they want to know when the party is! Needless to say we always oblige! This is such a rewarding experience that now each time we get to play for others in need of a little enjoyment we jump to it. A few weeks ago 8 of us from our Bluegrass Class performed for about an hour at a local rehabilitation center. It was the first time most of them had experienced this and they came out with the same feelings…..what a way to give back! Music brings us memories of different times in our lives, it brings us joy and for a little while it helps us forget our troubles. We are so grateful to my mom for having insisted that we play at her place. We give a little of our time to help others enjoy this life a little more but what we receive from them is 100 times over. Thanks MOM! NOTE: Silvia White took piano lessons in elementary school. She is a graduate of LSU where she majored in Education. 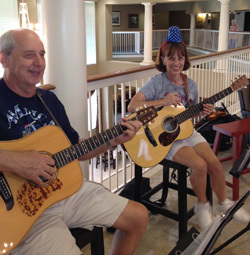 She taught secondary education for 35 years and upon retiring she started taking guitar lessons from Fretmentor. She followed her guitar lessons with mandolin lessons from the same instructor and is also learning how to play the fiddle. You will see her every Wednesday night at the Bluegrass Class offered by Fretmentor in Jupiter, Florida. Not everyone gets to claim the title of being a living national treasure. Yet, Doc Watson was a true American artist who made significant contributions to the development of bluegrass and folk music. Sadly, our living national treasure passed away at the age of 89. Arthel “Doc” Watson was born March 3, 1923, in Deep Gap, North Carolina. He lost his eyesight before his first birthday due to an eye infection. Despite his disability, Doc would became a master of both finger-picking and flat-picking style guitar playing. He also had a rich baritone voice and sang his songs with passion. Doc Watson made a name for himself at the 1963 Newport Folk Festival and in fact, was enthusiastically received by the crowd that came to listen to him perform that day. He later would join forces with his son Merle, performing as a father son duo. Tragically, in 1985, Merle died in a tractor accident. Merlefest, a premier music festival is held each year in Merle’s honor. Although he was well known for his acoustic guitar, Doc’s musical background actually started with a harmonica, a banjo, and later an electric guitar. He was a master at turning fiddle tunes into great guitar instrumentals. Watson is a multi-Grammy award winner, as well as the recipient of a lifetime achievement award and the National Medal of the Arts. I will always have fond memories of listening to Doc Watsons’ recordings on the “Will The Circle Be Unbroken album (United Artists, UAS 9801)” or by watching the “Three Pickers”, a 2004 Grammy Nominated Best Traditional Folk album and live Television performance. Sadly, two of three pickers have both passed only two months apart. Another six strings have gone silent.